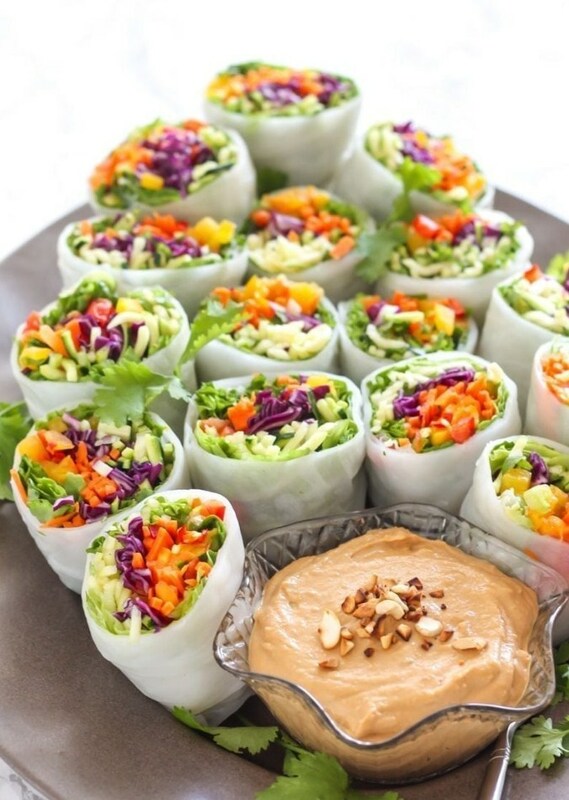 Packed with veggies, fresh herbs and sweet mango, these Loaded Veggie Summer Rolls with Cashew Tahini Dip are a perfect healthy summer appetizer. Toss all ingredients for the cashew dip in a blender and puree until completely smooth. Pour the sauce into a small bowl. Lay out all ingredients to fill the wraps, prepared as indicated above, on a tray or in bowls for easy access. One at a time, soak two rice wraps in a bowl of warm water until they soften completely. Lay the first one flat on a smooth surface, following with the other with about ½ of the wrap overlapping the first. (Layering will help prevent punctures and make the rolls more durable.) Arrange some of the fillings in a pile at the end nearest to you. Fold the edge nearest you over your fillings, then fold the left and right sides in as if making a burrito. Continue rolling away from yourself until the wrap is completely rolled up. Set it seam-side down on a plate. Repeat for the remaining rice wraps until you’ve used up all the fillings. Serve with the bowl of cashew tahini dipping sauce on the side. If you need to make these ahead of time, wrap them in damp paper towels and keep them sealed in a Ziploc bag or container with a lid.